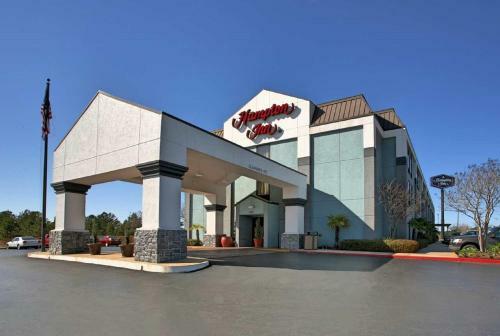 Situated in Natchitoches, this Hampton Inn is 6 miles from the Cane River Lake. It has an outdoor poll with sun-lounger terrace and offers guestrooms with lap desks and free Wi-Fi. Rooms at the Hampton Inn Natchitoches are decorated in warm colors and have modern furnishings. They include a flat-screen TV and come equipped with a coffee machine, microwave, and small refrigerator. Each morning the hotel serves a breakfast with pastries and fruit juice. Several steakhouses and restaurants offering international cuisine are located less than 10-miles from the hotel. The Hampton Inn Natchitoches is 12 miles from the Bayou Pierre Alligator Park and is 27 miles from the Bayou Folk Museum. It offers 24-hour front desk service and free on-site public parking. the hotel Hampton Inn Natchitoches so we can give you detailed rates for the rooms in the desired period.